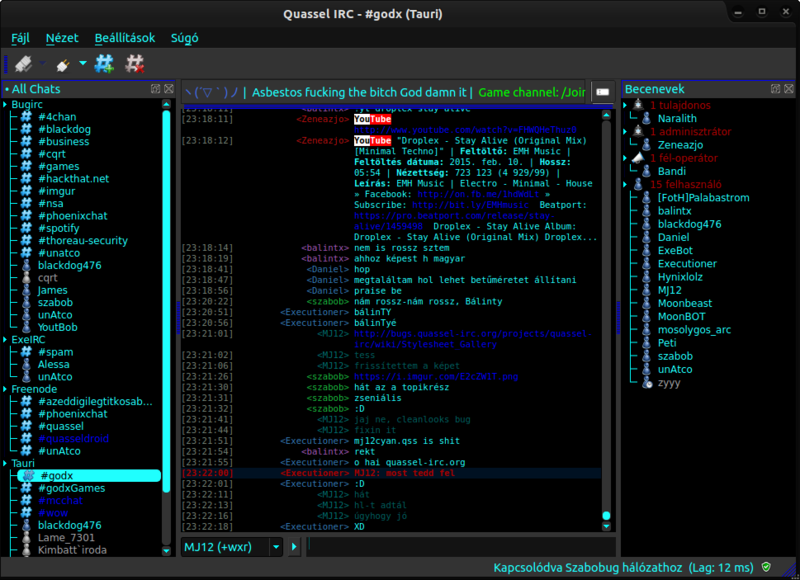 This is my qss (on windows). It is nothing serious, I've only added it because the gallery looked so naked. QWater theme created by Maarten. A liberal interpretation of the "Water" MTS theme from the mIRC NoNameScript. 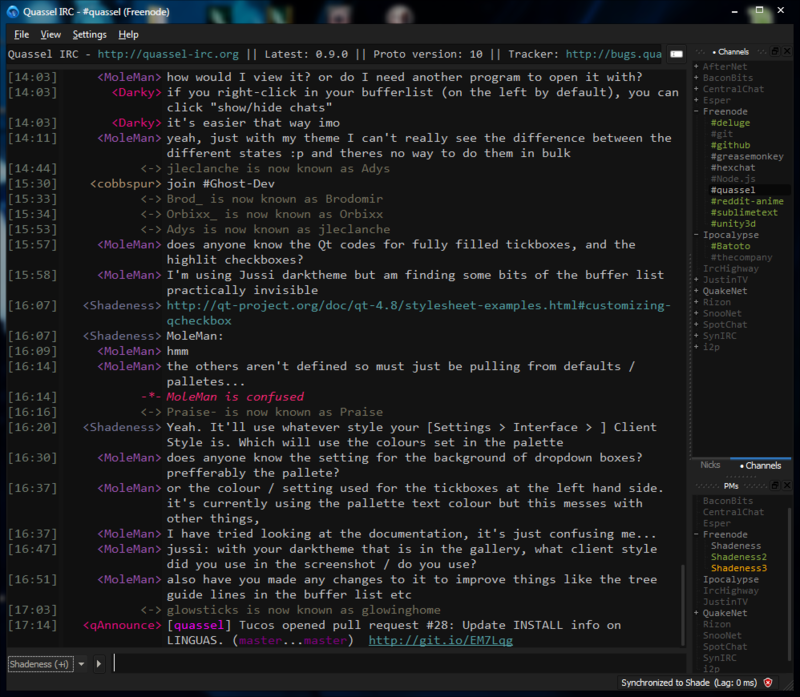 My stylesheet that I've developed for personal use over a long period of time. I'm mainly adding it due to the small size of the gallery. 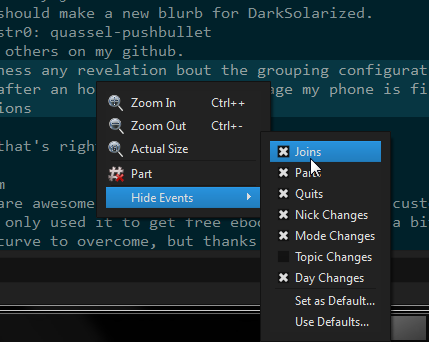 It's a dark theme with colorful accents. 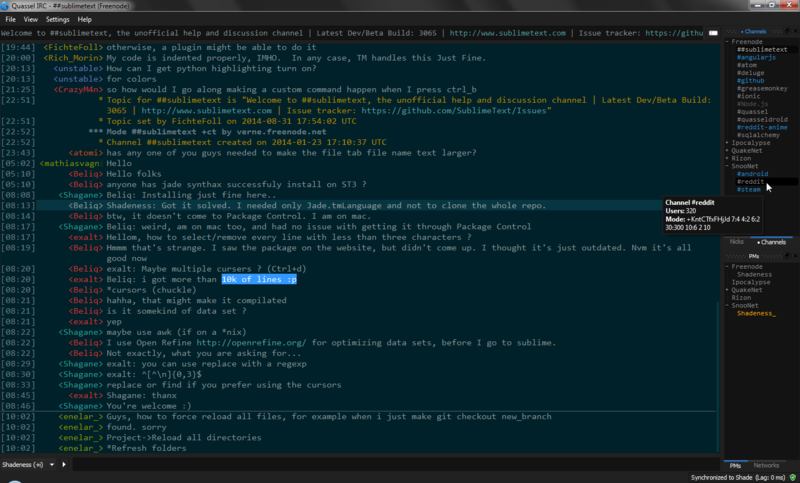 It's a black-cyan stylesheet I made in 2010. I've been using it all the time, and I like using it. I hope you will find it useful. I recommend using cleanlooks style for this stylesheet. This theme is designed to work on top of the Plastique client style. It will look weird on almost all the others (including the system default). If Plastique isn't there, Fusion should work. Go to Settings > Configure Quassel (F7) > Interface > Client Style and set it to Plastique or Fusion. 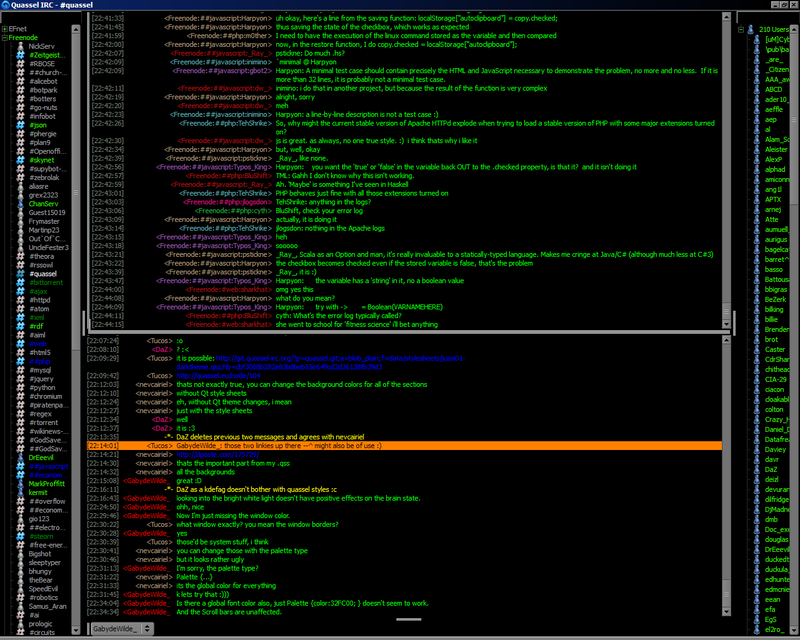 Go to View > Chat Lists > Configure Chat Lists. 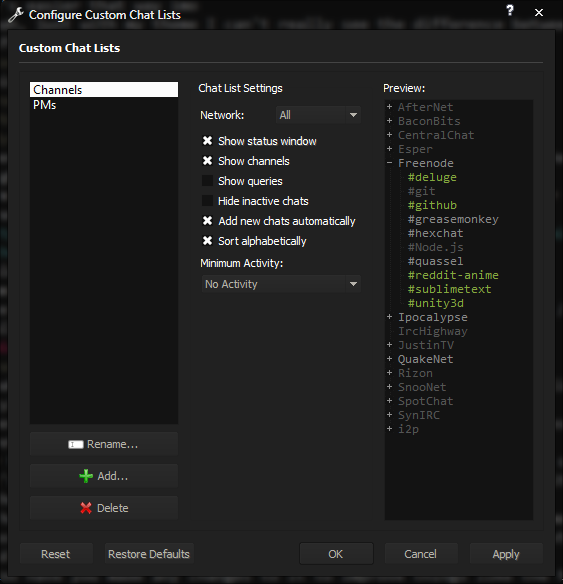 Then create 2 chat lists like in these images (Channels | Queries/PMs). 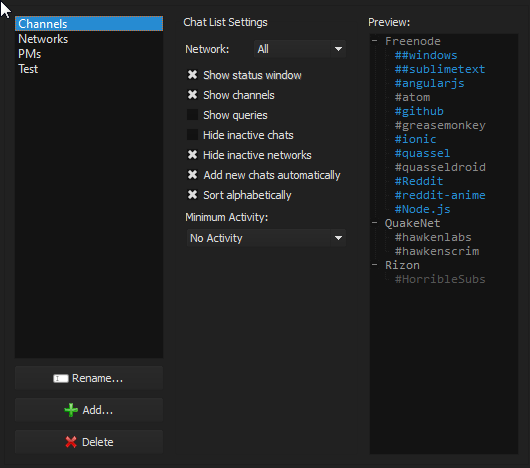 Then click the titlebar of the chat list widget and drag onto the nick list widget. Drag to the center to have a tabs. Drag to an edge to have a 50/50 split. 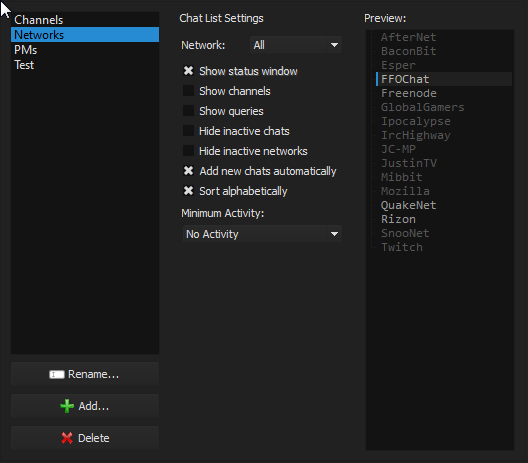 Go to Settings > Configure Quassel (F7) > Chat & Nick Lists > Show Icons and untick it. 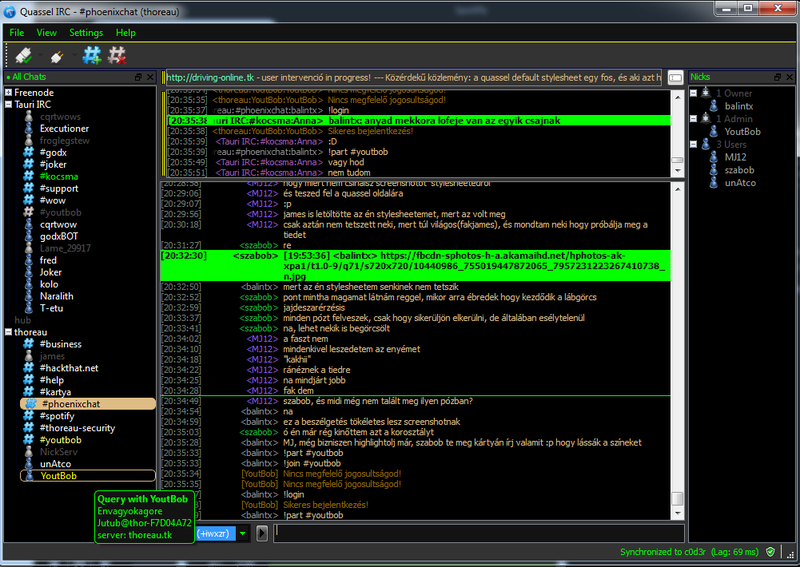 Go to Settings > Configure Quassel (F7) > Chat View > Timestamp format and set it to [hh:mm]. Then drag the column splitter between the timestamps and the usernames to fit like so. 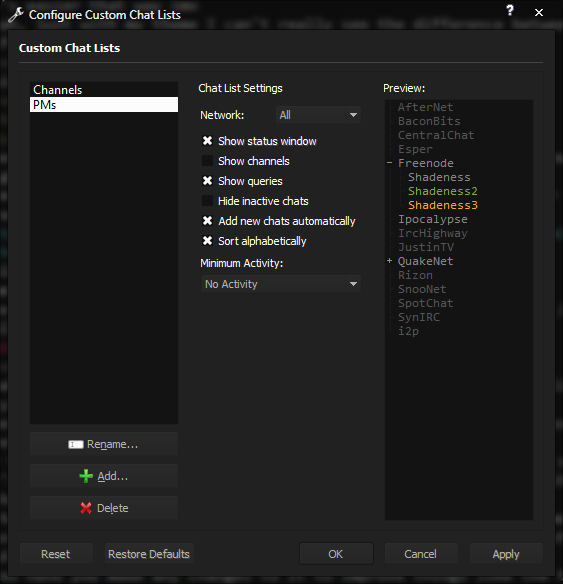 Go to Settings > Configure Quassel (F7) > Chat View > Custom chat window font and set it to Consolas 12pt. Go to Settings > Configure Quassel (F7) > Input Widget > Custom font and set it to Consolas 14pt. Right Click the chat area > Hide Events > Join. Repeat this for all the other message types. When done, choose Set As Default to hide on all chats. 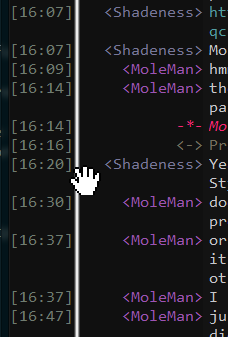 When you are done moving widgets around and other elements. Lock the layout at View > Lock Layout to hide the handles. Forked from DarkMonokai.qss and inspired by https://github.com/antoligy/SolarizedQuassel. 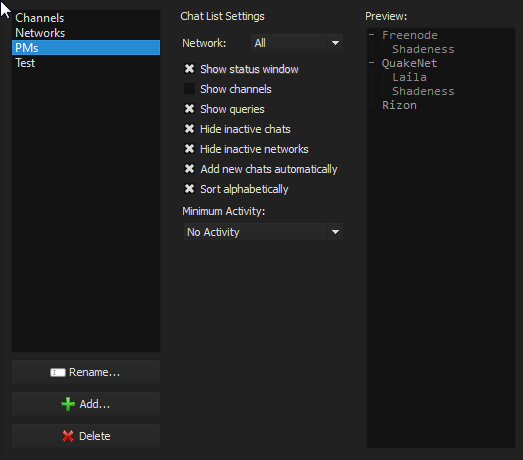 Create a 3rd chat list called Networks that doesn't show channels or queries. 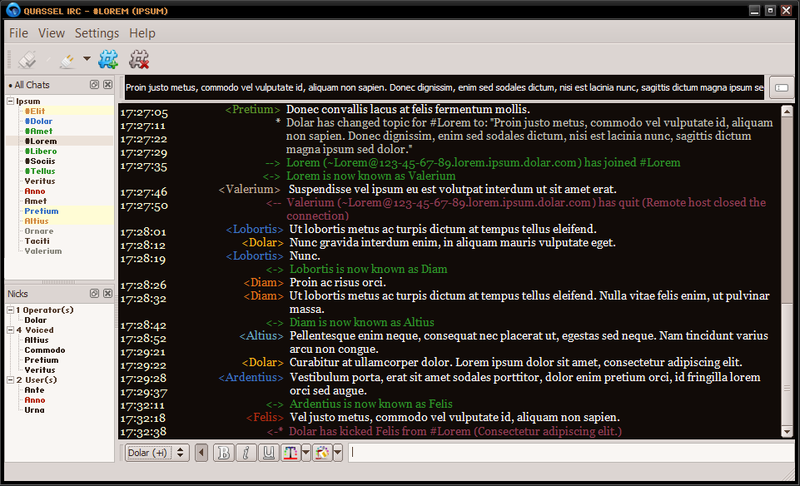 I've made this stylesheet in 2010, and using it since then. Some of my friends are using it, too, and they suggested me to share it, so here it is, I hope you'll like it!